Stevens Traceability has been awarded the esteemed, internationally recognised ISO/IEC 27001:2013 certification. Warrens Bakery Ltd has had a Stevens Traceability System for 17 years. After upgrading their Vantage 1 terminals to the Vantage 2, they are now reaping the benefits in production. On the 11th February 2019, the world celebrates Inventors Day which occurs on the birth date of American inventor Thomas Alva Edison. Mr Edison held over 1,000 patents for inventions including electric power generation, mass communication, and sound recording. The occasion also coincides with our launch of a new Average Weight System. At Stevens Traceability Systems, our team of engineers, software developers, and mechanical design engineers continuously develop and evolve the Stevens product range, with the latest evolution being a new Average Weight System. Designed by Mechanical Design Engineer Tom Clarkson, the new Average Weight System has been designed for manufacturers of goods that are sold by average weight in England, Northern Ireland, Scotland, and Wales. It provides traceability by accurately checking and automatically recording average weight data. “The introduction of our new range of terminals gave us the opportunity to re-design some of the associated products to simplify manufacturing, assembly and spares holding” said Tom. Tom designed the Average Weight System to incorporate our new Venture terminal along with a trade-approved weight indicator. Its bespoke stainless-steel design has been fabricated to ensure strength, durability and corrosion resistance with the food industry in mind. “It’s simple and easy to clean and maintain and provides a sleek yet robust solution” Tom added. Originally launched to the market in 2005, the Vantage 1 terminal has now reached the end of its serviceable life and is recommended to be replaced by the newer Vantage 2 terminal. Merry Christmas & Happy New Year from Stevens! Stevens have had a great 2018, with new products, software and services released. We hope you all have had a prosperous Year and wish you all a Merry Christmas and a Happy New Year. Our Head office closes at 16:00 on Friday the 21st of December. We reopen at 08:30 on Wednesday the 2nd of January. Our Service team will be on call during the Christmas period except for the 25th of December and the 1st of January. Jessica Tozer, Technical Team Leader at Stevens Traceability Systems is delighted to be on the judging panel at this year’s EEF Future Manufacturing Awards. The awards celebrate the success of UK manufacturers and apprentices and entries for the award categories are submitted by regional. The regional award winners are automatically entered for the national awards, with the national winners being announced at a prestigious gala which takes place in London in January 2019. Having won the EEF Apprentice of the Year Award in 2016, Jessica went on to speak at a parliamentary summer reception for British manufacturers at the House of Lords in Summer 2017. Jessica’s speech described what it’s like to be a young woman entering the manufacturing industry, and how apprenticeships are a great way to bring new talent into the industry. Two years later, Jessica now manages a Stevens technical, service and calibration engineers in the South of England. Jessica will be helping to judge this year’s nominated apprentices both regionally and nationally and continues her great relationship with EEF, where she undertook her apprenticeship at their training centre in Aston, Birmingham. On the 4th October, Stevens showcased their Essentials Traceability System and weighing equipment at the Annual Celebration of Food & Drink: Lancashire Style. The food and drink event held at the award-winning Stanley House Hotel & Spa located in Mellor, Lancashire, was the 4th annual event organised by NatWest. This sector-specific exhibition welcomed businesses from across the county, from catering, packaging, cleaning, insurance, beverage, food and more. The Essentials Traceability System got lots of attention from attendees and exhibitors and Paul Dungworth, Area Sales Manager for the North, demonstrated how the system uses the stock management module and production module so that operators weigh ingredients accurately to ensure product consistency and capture ingredient lot numbers for traceability purposes. With over 35 exhibitors and 150 attendees, the event had an energetic atmosphere, new connections were made, and Paul and Amanda (pictured above) even discovered (and sampled) orange jalfrezi chocolate made by a local chocolatier! Waste and waste management has been an extremely topical subject for many years across the globe, with food waste receiving further attention more recently in the UK from the Government and high-profile media campaigns such as “War on Waste” led by professional chef Hugh Fearnley-Whittingstall. His mission, which was aired on the BBC, was to change the way we think about waste by challenging the supermarkets and fast food industry to drastically reduce the amount of waste they generate. However, it’s not only the supermarkets and fast food industry who produce food waste, but food manufacturers also account for 1.7 million tonnes of waste each year, costing the food manufacturing sector £1.2 billion per year. So why is food waste a concern? Food waste has economic, environmental and social impacts; Greenhouse gas emissions are produced when food is decomposing on landfill, as well as when it’s transported. These greenhouse gases have a global impact on temperature and weather systems, with the ‘greenhouse effect’ resulting in global warming. Food wastage from manufacturers can occur at any point during the food manufacturing process. For example, at pre-production, there could be inaccurate forecasting of raw materials which may not get used fully and leftovers go to waste. During production, waste can happen through spillage, spoilage, even plant shutdowns and washes. Ingredient waste can also occur during the food production process from peeling, washing, slicing and even boiling. According to WRAP.org.uk, 9% of waste in the ready meals and chilled products sector is caused by machine mishandling, and 3.5% of products are rejected for poor production such as under or over baking, or under or overweight. Cancellation of orders, packaging, and end of sell-by-date products are also a cause of food waste. It’s not only important to reduce food waste for the good of the environment and economy, but waste can also have a huge impact on the bottom line for food manufacturers. The tips above are just a few ways to reduce waste in the food processing industry, however, Stevens Traceability has a waste management system which is proven to reduce product giveaway, wastage and conform to traceability audits and average weight regulations. By having full traceability of raw ingredients from goods in, throughout the production process and through to waste, the Stevens system provides reports so that you can improve performance, make production more efficient and reduce the costs of materials, labour, and energy. What’s more, you can ensure collections of waste are scheduled in line with actual waste on-site, reducing unnecessary collections, further helping the environment and reducing waste collection costs. Stevens Traceability Systems Limited are pleased to announce their strategic partnership with leading instrumentation maintenance and management company, Envogen UK Limited. Having provided weighing and traceability solutions to manufacturers operating in the food and beverage, industrial, waste and logistics sectors for over 100 years, we know how important it is for manufacturers to comply with industry regulations. This extensive experience has also allowed us to fully understand the importance of ensuring that production is at full capacity for maximum profitability, and it’s for this reason that we have appointed Envogen UK Limited as a strategic partner to support our service offering. Working with Envogen UK Limited, allows Stevens Traceability to not only ensure that manufacturers comply with the ever-increasing regulations when it comes to product safety, employee safety and disposal of waste procedures using our award-winning modular software and weighing equipment. It also enables us to extend our current service provision to weighing equipment and associated assets, to include Instrumentation calibration services. Envogen provides a comprehensive, cost-effective range of on-site service that includes calibration, preventative maintenance, planned shutdown work, installation, and commissioning. They certify the instrumentation within the client’s plant, allowing them to demonstrate compliance with their Regulatory Authority, British Standard, FSA, FDA, International Standard or other Governing bodies. These services are supported by an in-house repair service, to all of the above instruments and they are able to supply replacement instrumentation at competitive prices. The launch of The Great British Bake Off in 2010 ignited the nation’s passion for baking. People of all ages and baking experience have attempted the signature dishes, showstoppers and technical tests at one time or another; all no doubt with varying degrees of success. Junior Bake Off, the spin-off series, saw future artisan bakers take to our screens with the aim of impressing the judges with their flaky pastry and gingerbread houses. Not only did we see the British public tune into the programme in their millions, viewers took to the Supermarkets in their droves. Sainsburys for example, saw sales of orange jelly increase by 150% overnight when the contestants were tasked with making Jaffa Cakes (1) in 2016. The show is also credited by many as being integral to the rise of Artisan Bakeries and their increase in popularity among the British public. The independent bakery sector has enjoyed years of growth thanks to the likes of Paul Hollywood and Lorraine Pascale championing the art to the masses. 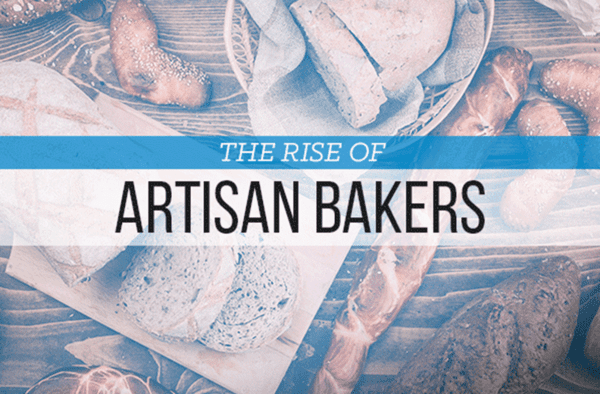 The word ‘Artisan’ typically signifies care, expertise and quality of ingredients. There are currently no official restrictions on who can use these terms, so it’s always worth finding out the story behind the label. For example, Macleans Bakery in Forres, Inverness, Scotland, are a Stevens Traceability client. They are fourth generation family bakers and have held the title of Scottish Master Bakers. A family-run company, they produce traditional shortbreads, sweet biscuits and oatcakes from recipes handed down through the generations. In the 100 years they have been baking, the team at Macleans Bakery have witnessed many changes in their industry, but one thing that hasn’t changed is the quality of ingredients, quality of finished product and eating quality and flavour. As a nation we have a fondness of bread which spans thousands of years, however in recent years an increase in coeliac disease (gluten intolerance) and food allergies in general, has seen consumers taking more of an interest in what is in their food. This has provided independent bakeries with an opportunity to bake products which meet the needs of niche markets. Independent bakeries are typically in a better position than the national bakeries to respond quickly to a change in consumer tastes by removing or reducing the ingredients typically associated with intolerances and allergies i.e. yeast and additives. The introduction of sourdough into the baking process has enabled bakeries to continue offering products to this marketplace. Nowadays, consumers are not afraid to ask for the details when it comes to ingredients. They are also more demanding as far as product consistency goes. They want the same taste and same size of product each time; regardless of whether they are buying from an independent bakery or Supermarket. This is where recipe traceability plays a part. Many independent bakeries still take a manual approach to the weighing of ingredients which is typically down to the costs of introducing automation into the process. At Stevens Traceability our Essentials™ Modular Software has been designed specifically for smaller, independent bakeries. Our system supports you in delivering on product consistency and traceability of ingredients leading to a reduction in costly giveaway. Introducing automation into the baking process, ensures you can deliver what the customer wants; namely consistency of product and quality. In addition, your bakery benefits from increased productivity and visibility of the entire operation. Introducing the Essentials™ Modular Software into your production process, reduces the amount of manual labour from the process, provides statistics of the batch, manages product giveaway, ensures consistency. All of the previously mentioned gives you the time to focus on developing new products and most importantly growing your business. As a nation of bread lovers, we purchase over 3,500,000,000 sandwiches each year (2) – this reaches 12,000,000,000 if you count the ones you make yourself (3)! Artisan bread is easier to digest than mass-produced bread, because the enzymes have had time to begin breaking down the gluten in the flour while fermenting. And you can take time to savour it too – as a rule of thumb, the longer the production process, the longer its shelf life will be (4). Sugar keeps everything together when baking (5). Aside from sweetening the baked goods, its role is to bind the water, meaning it attracts water and keeps it from the other ingredients. A rolled-up piece of white bread was used to erase graphite before rubber erasers were invented (6). © 2019 Stevens Traceability Systems Ltd.